What makes a granola a killer granola? I’m so glad you asked! One that includes butter, crunchy coconut and a bounty of seeds. Toasted coconut is buttery enough, but coated in a brown sugar, butter and mixed with golden oats? Chop up the walnuts or use any other nut you want! I love a good toasted walnut, don’t you? 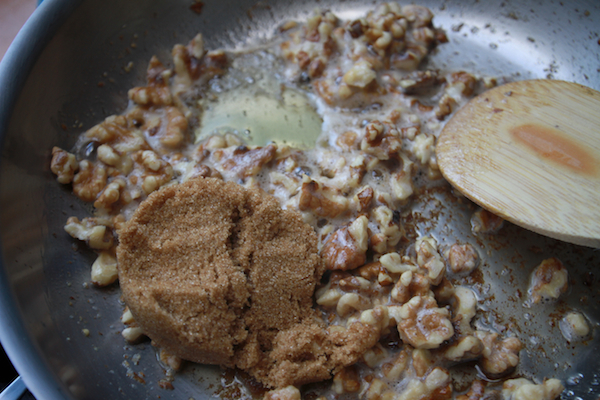 Melt butter in a pan, add in the walnuts, toss to coat. I’ve never done this to a granola before. And then we add the sugar. Hummina Hummina. Stir in the vanilla at the very end. We do this so we don’t burn off the vanilla taste. That would be a waste of vanilla. Now we get the rest of the ingredients in a bowl. Would you just LOOK AT THOSE GLAZED WALNUTS?!! 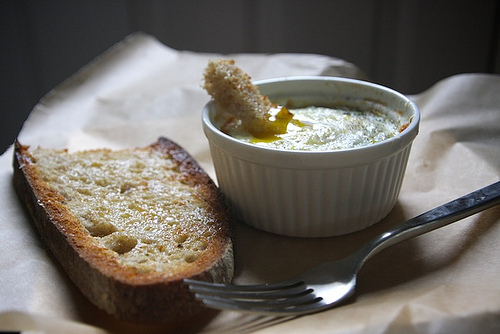 Mix really well and then spread it out on a parchment lined baking sheet. And we’re toasted! You see those coconut flakes? Cooper picks them all out and eats them. I really don’t blame the kid. I need to make him his own tray of toasted coconut. 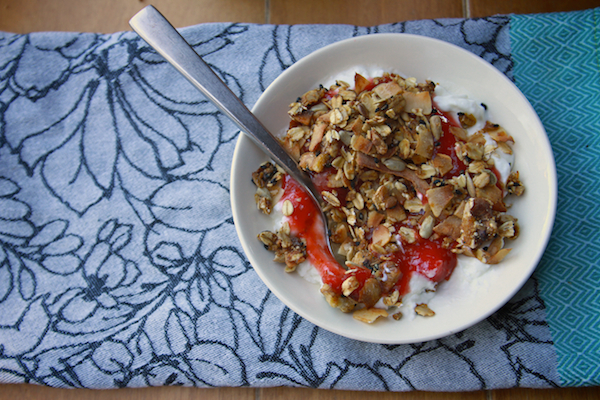 I had this granola for breakfast for a week straight with plain yogurt & a peach plum compote. I was sad when I ran out. You would be too. Preheat oven to 325F. Line a baking sheet with parchment paper or a baking mat. In a small saucepan, melt the butter with the salt over low heat. Add the chopped nuts, increase the heat to medium, and cook, stirring frequently for 5 minutes, or until lightly toasted. Add the honey and brown sugar, reduce the heat to low, and stir until melted and combined. Remove from the heat and stir in the vanilla extract. 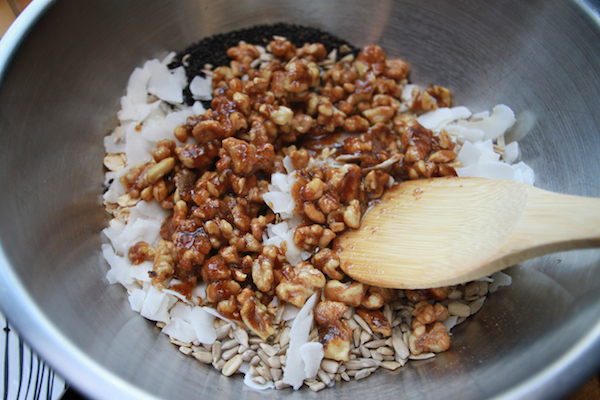 In a large bowl, combine the oats, coconut, sunflower seeds and sesame seeds. 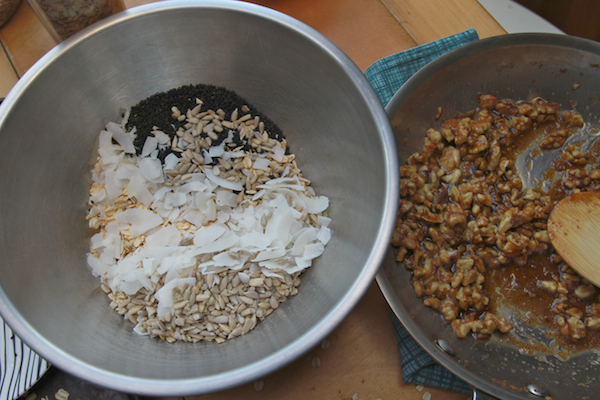 Add the sugar mixture and toss until the oats are evenly coated. Spread the granola evenly on the prepared pan. Place in the oven on the middle rack and bake for 15 minutes. 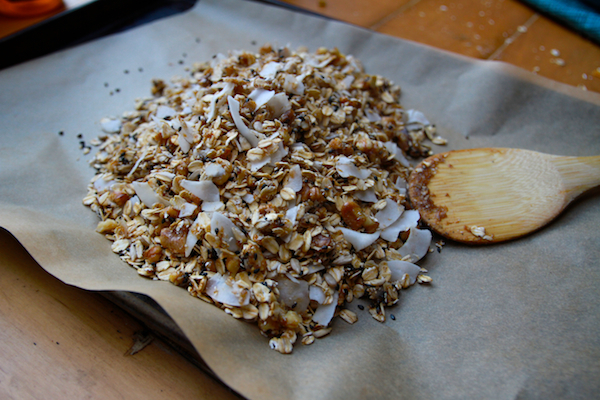 Remove from the oven and stir to redistribute the granola. Bake for an additional 10 minutes, or until golden brown. Let cool completely on the baking sheet. Store the granola in an airtight container. I make a lot of granola, including a variation with butter, but I’ve never thought to glaze the walnuts. What an excellent, decadent granola addition–I’d say it’s right up there on par with crystallized ginger and cacao nibs (not together!) as a fancy-er up of granola. Oh this does look KILLER!! I’ve always just bought my granola ready made, but I am so gonna ditch the laziness for 5 minutes and make this! Brown sugar, honey, oats, coconut…yes, this is killer granola for.sure. I bet your house smelled amazing while it was baking! This looks like such a fiiiine recipe! Love this idea! Hummina Hummina indeed! I’m going to make this for my kiddos tomorrow! Thanks again Tracy! Making granola is one of my favorite things. So easy and such a delicious reward. I will have to give this one a shot! I’ve never seen granola made quite like that either. Thank you so much! i think i really need this in my life, and I need to make it soon! I’ve been eating yogurt and granola for awhile now as my midmorning snack, and this would be a welcome addition. Although, when I saw the first picture, I was really scared, thinking that you had put bacon pieces in the granola. Thank GOODNESS I was way off! Haha! The coconut is pretty hearty/savory though! Tracy, thanks so much for posting this!!! I was seriously just looking for a granola recipe. I can’t wait to make this! 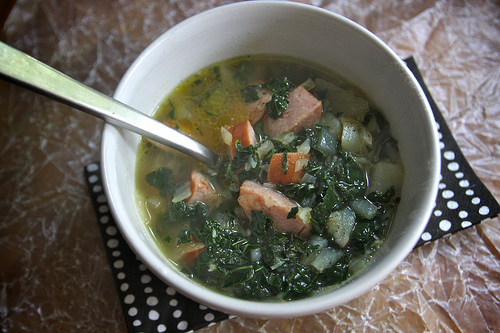 Thank´s for share this recipe!! Good, Good, Good!! I’ve been hooked on your coconut almond granola for a while, but now I’m sorely tempted to change things up with this recipe. those walnuts look INSANE. follow-up: I made it. it was totally killer! but where did you find your black sesame seeds? I could only find the white ones (I checked Whole Foods and TJ’s), and while I’m sure the flavor is just as good, it wasn’t quite as pretty as yours. please enlighten me! I actually got mine at Whole Foods! Weird. They are in the Asian section in a big plastic tub. If you have a good store around you that has bulk spices, you can find them really cheap. I wish I could just give you some. I have TOO MUCH. Try Penzey’s spices for black sesame seeds. They are good quality, very fresh and the price is good if you consolidate a lot of items to get cheaper shipping. I always do mail order but they also now have a few stores across the US. I also get all my vanilla from them. Great granola! I’m going to make it again as soon as I find the time! ahhh Tracy, this looks so delicious and amazing! just made a batch last night. no boxed substitute for the homemade stuff! looks so perfect! 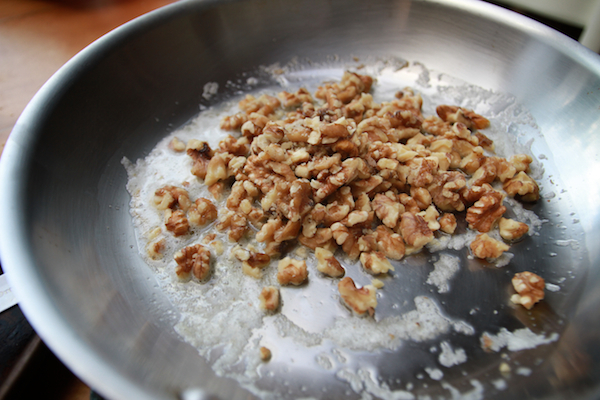 Oh, what a great idea to caramelize the walnuts beforehand! 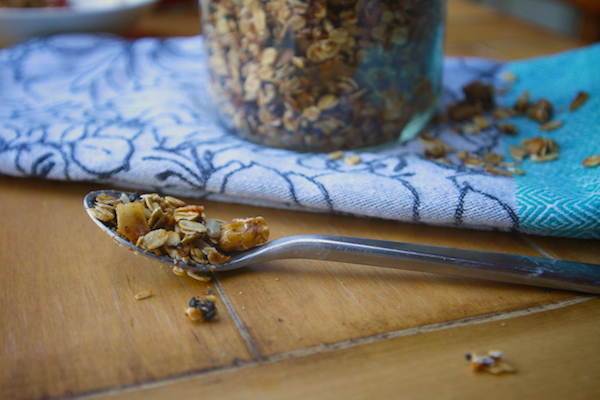 You really can’t beat homemade granola – way better than store bought. have never gone the butter route in granola, but i think it’s high time to try. thanks for the inspiration! my mouth is watering! 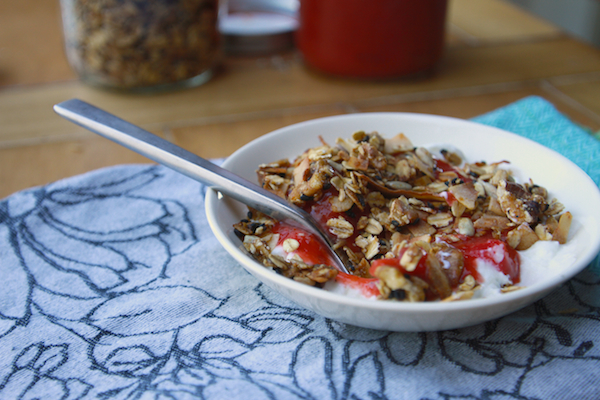 i always love your granola recipes and i’m sure this one will be no exception. i also really LOVE the 1st photo. well done! Woooooow, walnuts like this are KILLER! I am so excite4d about this, and I could not be more serious. This is my granola making week, just ran out. I am making my go to olive oil granola, and now THIS. I would never have thought to do that to the walnuts, and I can’t imagine a better way to do it. Yum Yum Yum:). The first, and only, time I’ve made granola I cooked it too long and everything had a burnt taste and the dried cranberries were rock hard. Total granola fail! I am excited to give this a go, I hope for better results this time. Live and learn right?! Out the cranberries in after you baked the granola! They don’t need to be cooked. You’ll find much better results that way. Oh gee, silly me! hahah thank you so much for the tip!!! Delightful. Will be trying this for sure! Love this idea! I make granola a lot & I’m getting super bored with my usual recipe. I could step it up a notch just by glazing the walnuts! I’ve been waiting for a good granola recipe to try and this one look not-too-oaty, which is the problem I’ve had with a lot of other granolas. I just made this today. It is scrumtious. My kids love it. I might have to stash some away before it’s completely gone. Thanks for the recipe. I love your blog!!! ***sigh***. I soooooo need this breakfast. I’m going thru a VERY rough time and this breakfast looks like just what the doctor ordered! I’m making this. Right now. I drooled a bit reading this. YUM. Holy mackerel was this delicious. I just moved (Sunday) and this was the first thing I officially made in our new place. It might be my new favorite version. Gracias. This looks amazing Tracy! My mum used to make granola for us all the time when I was little! So great. 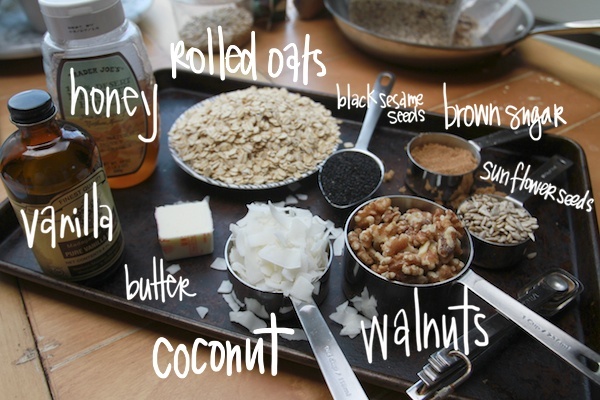 I am SO overdue for a granola making afternoon – DOING THIS! That looks so good! But I’m terrified to make it. If I have granola in the house, I can’t NOT yolo it all. 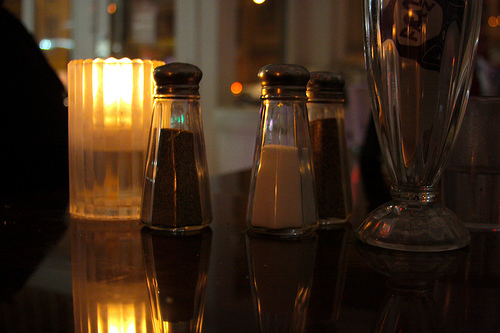 jar it up. give it to friends. save some for yourself! I love granola and I’m going to try this because you made it sound so enticing. 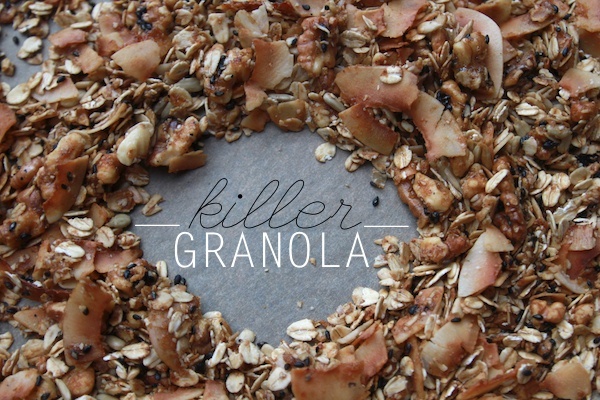 I mean how can you not make a recipe labeled “killer granola”. My favorite granola and one that I top on my go lean crunch every day is Cafe Fanny. I hate the price tag, but love the granola. haha! My thoughts exactly. They had me at killer! I’ll have to try that granola. I’ll look out for it. hey shutts! i love granola. the killer buttery version is major. and while, i’ll definitely have to try out this recipe, i might first toast up a batch of coconut flakes–cooper is on to something. thanks for sharing! Oh my goodness does this look good!! I have everything on hand except the black sesame seeds. Where can I find them? I live in the Bay area. Thanks! I have found them at Mitsuwa in San Jose. It is a Japanese grocery store that has all sorts of lovely stuff. You can get a giant jar of black sesame seeds for not too much money. It is right of 280 near the Saratoga exit in San Jose. 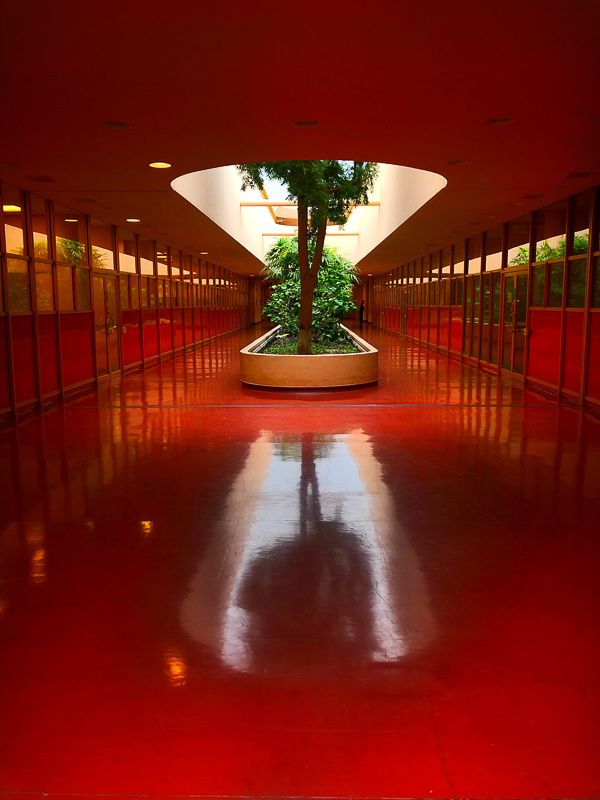 Totally a fun place to explore. I picked up some at Whole Foods. The giant jar was less than $5. I think you can also find them at Cost Plus World Market and see what Nicole recommends! Thanks so much Tracy and Nicole! Looking good…looking good. I can’t wait to try this one out! Calvin is totally into granola bars these days, but maybe I can convert him to the real thing. Loves. Off to make myself some toasted coconut! Do you buy coconut flakes, or shave it yourself from a whole coconut? If you buy … where, please? I can get them at our local Whole Foods. Do you have one near you? Is there a taste difference Btwn the black vs white sesame seeds? Tracy – I think we’re granola kin because I made a pretty similar granola last week while cleaning out the pantry! 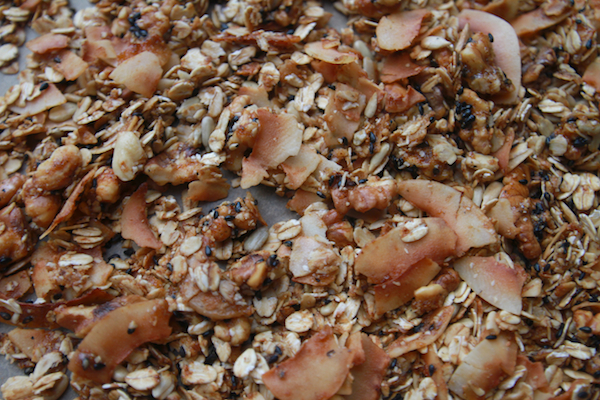 Had to emerge from “lurkdom” to comment – this granola is dead easy to make and delicious. I’m eating a bowl right now for my brekkie – although the black sesame seeds floating around in the milk do look like some fruit flies up and died in my bowl. I switched out the walnuts for pecans and ate about half of them while the granola was still cooling. Love the site Tracy. Butter, honey, walnuts, coconut???? What’s not to love! 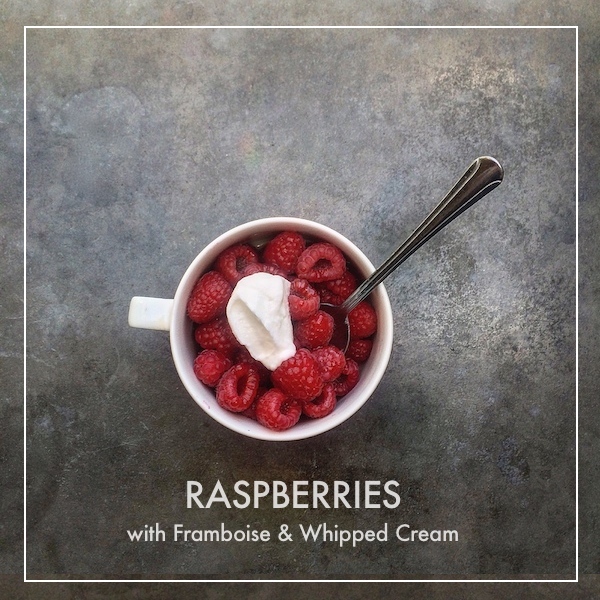 Awesome recipe, and photos! I’ll be trying this soon! 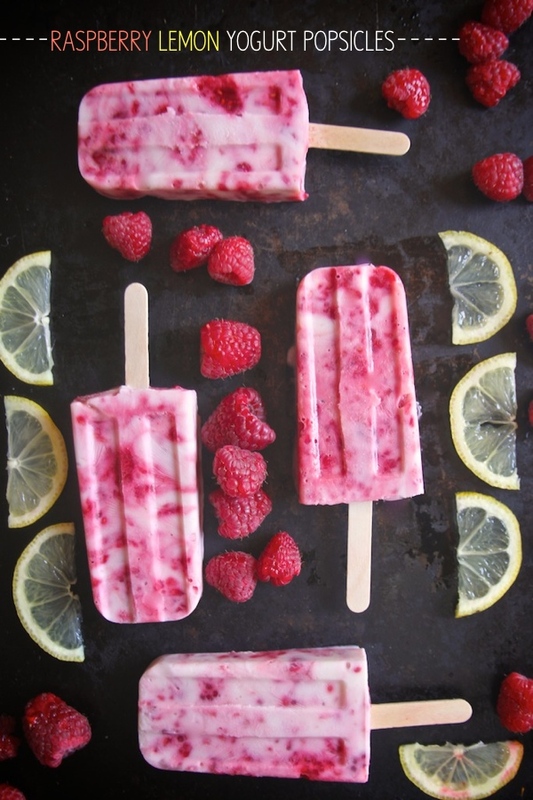 That flaked coconut is calling my name! 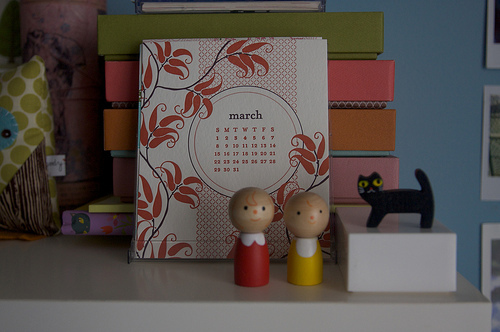 I loved it so much, I blogged about it, too! Thanks, Tracy! Mine took 45 minutes in the oven because I expected the usual dark browning of granola but I took it out before it got burnt. So delicious! Love your site I’m glad to ave discovered it. I happen to have black sesame in the house. Killer gronola, you’re gonna kill me… in my tummy. 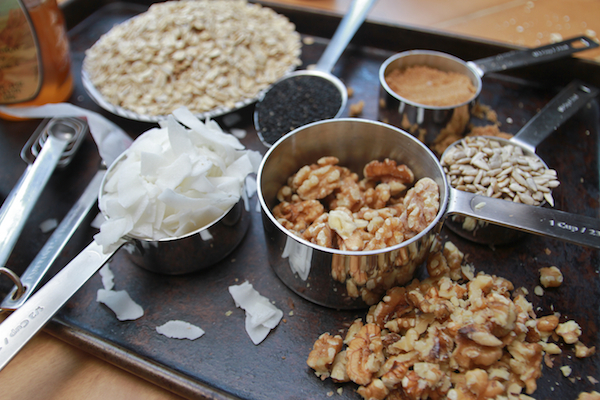 Hi Tracy: If you are making this granola as a gift, how early in advance can you make it? Will it keep in Ziploc bags for several weeks? Thanks! It should! And if you’re ever worried about freshness, you can totally freeze granola. i die! 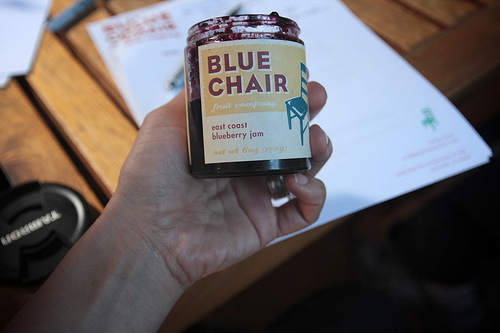 i must make a few jars for holiday gifts. do you happen to know if i can ship it? or how long it lasts? i don’t want it to travel 4 days and arrive near its expiration date. thanks! I accidentally bought quick oats instead of rolled oats. Tracy, do you think that would be a problem in this recipe since the quick oats are smaller pieces? Just go with it!! I don’t think it would be a catastrophe. Just a little different. Lemme know! Woof. I’m SOOOOOOOO disappointed in my results with this recipe 🙁 Am trying to figure out why it’s all so dry but maybe I let the sugar and honey mixture cool for too long. It tastes yummy but doesn’t resemble any granola I’ve ever made or seen. Oh well -live and learn! This looks s’wonderful! I’m loving how many gluten free options that you have on here. YAY! Finally tried this! I used coconut oil instead of butter. Absolutely divine with yogurt! I just made this tonight. This recipe lives up to its name! It is tops in my book, equal to the best I’ve ever had. Not many granolas are this good!